common name for some members of the Papaveraceae, a family composed chiefly of herbs of the Northern Hemisphere having a characteristic milky or colored sap. Most species are native to the Old World; many are cultivated in gardens for their brilliantly colored if short-lived blossoms. Many of the species have several varieties and show a wide range of colors, especially in red, yellow, and white shades. 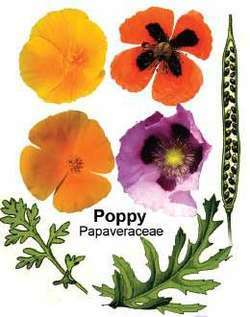 The true poppy genus is Papaver, but many flowers of related genera are also called poppies. The most frequently cultivated are the Oriental poppy (P. orientale), usually bearing a large scarlet flower with a purplish black base, and the corn poppy (P. rhoeas) and its variety, the Shirley poppy. Other well-known species include the arctic Iceland poppy (P. nudicaule), the celandine poppy (Stylophorum diphyllum) of North America, and the cream cups (Platystemon californica) and California poppy, or eschscholtzia (Eschscholtzia californica), of the W United States (the latter is the state flower of California). ..... Click the link for more information. family.) The orange-red sap of the bloodroot (Sanguinaria canadensis), an early spring wildflower of E North America, was used by Native Americans as a dye and skin stain. This and many other members of the family are employed for various medicinal purposes. substance derived by collecting and drying the milky juice in the unripe seed pods of the opium poppy, Papaver somniferum. Opium varies in color from yellow to dark brown and has a characteristic odor and a bitter taste. principal derivative of opium, which is the juice in the unripe seed pods of the opium poppy, Papaver somniferum. It was first isolated from opium in 1803 by the German pharmacist F. W. A. Sertürner, who named it after Morpheus, the god of dreams. , alkaloid found in opium. It is a narcotic whose effects, though less potent, resemble those of morphine. An effective cough suppressant, it is mainly used in cough medicines. Like other narcotics, codeine is addictive. See drug addiction and drug abuse. , opiate drug synthesized from morphine (see narcotic). Originally produced in 1874, it was thought to be not only nonaddictive but useful as a cure for respiratory illness and morphine addiction, and capable of relieving morphine withdrawal symptoms. ..... Click the link for more information. . Poppyseed, also called maw seed, is not narcotic; used as birdseed and for a flavoring or garnish in baking, it is also ground for flour. Poppy oil, derived from the seeds, is employed in cooking and illumination and in paints, varnishes, and soaps. ..... Click the link for more information. , class Magnoliopsida, order Papaverales, family Papaveraceae. Any of various ornamental herbs of the genus Papaver, family Papaveraceae, with large, showy flowers; opium is obtained from the fruits of the opium poppy (P. somniferum). 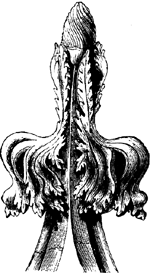 An ornament generally used for the finials of pew ends and similar pieces of church furniture. Poppyseed Media was founded eighteen months ago and, since then, has had a number of contract wins including trade and consumer exhibitions such as the London Motorsport Show, The European Limousine and Chauffeur Show, The International Party Show and Design Edge. He said: "Apparently Dodson & Horrell changed their supplier of oatmeal, which ended up coming from Eastern Europe with poppyseed in it. Lemon Poppyseed is reminiscent of bakery shop muffins. Rich's[R] Full Line of fresh rolls include such tasty assortments as the Egg Onion Roll Dough, Hoagie Roll, and Fully Baked Golden Poppyseed Kaiser. And then there were George the Lesser and Poppyseed. Our trio had the spinach quiche with cheese soup, a garden salad and a poppyseed muffin for $6. Starting with a basic pound cake, she has added a variety of flavors to the line, such as poppyseed, sherry, banana-pineapple, brown sugar, and chocolate. The dressings are available in five flavors: Tzatziki Ranch, Avocado Cilantro, Strawberry Poppyseed, Roasted Garlic and Curry. Object of the contract comprises delivery and installation of the production line consisting of the various technologies that mak prepared to have a sufficient quality for the production of high poppyseed oil. Chocolate tart, honey and poppyseed cake, lemon and basil pannacotta and mint chocolate mousse were all on offer for dessert so we ordered the first two from the menu.